From January 3, 2019 to February 1, 2019 the solar panel system generated 2,395 KWH for a total monthly savings of $276.14. For Commercial Connection Fees, click on "Ordinances & Policies", click on "Policies" and select Commercial Sewer Service Policy. To set up a new sewer and water account, please select the appropriate form listed below or contact the main office at (775) 267-2805. Indian Hills General Improvement District Wastewater treatment plant. Our treated effluent water is also stored by Sunridge Golf Course (SGC) for irrigation, when they need irrigation water we start sending it from our holding ponds to them through a gravity flow pipeline. On its way to the golf course it’s routed through a chlorine system, chlorine (sodium hypochlorite) is added to kill bacteria to a level that is regulated by the Nevada Department of Environmental Protection, that level is two parts per million or less, we monitor that effluent water very closely. We deliver approximately 120,000,000 gallons a year. Indian Hills and SGC have a fifty year agreement which gives us a place to dispose of our effluent while serving the Golf Course with much needed irrigation water. Detention Ponds at Wastewater treatment plant. We have recently completed several upgrades to our facility. 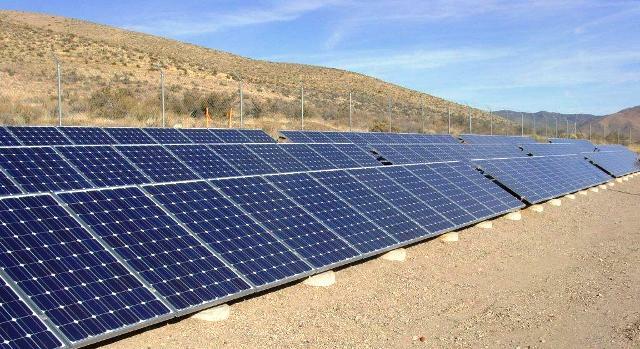 On December 16, 2011 our solar system went online, we have seen an average cost savings of $500. a month, we also upgraded the headwork’s with newer equipment, which is designed to clean the raw sewage water of inorganics and organics, wastewater is made up of about 95% water, the rest is solids such as inorganics and organics, after this process is completed the raw sewage is sent to the Sequential Batch Reactor (SBR). 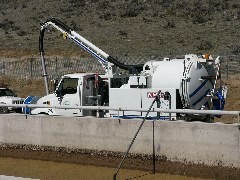 After being treated in the SBR system it is sent to the newly added dewatering system which removes the water from the solids, sends the clean water back into the treatment system, while the solid material is placed in a trailer and hauled to Bently Ranch, where it is mixed with mulch and used as fertilizer on their fields. Solar Panels at Wastewater treatment plant. On December 16, 2011 our solar system went online, we have seen an average cost savings of $500.00 a month. The District has seen substantial growth, and with this growth the wastewater treatment staff is faced with many sewage transport and treatment challenges. The largest challenge being the control of fats, oils, and grease being discharged into the sewer system. Grease is the accumulation of animal and vegetable fats found in cooking materials. “FOG”, fats, oils, and grease, can be the cause of many problems in the sewage transport and treatment industry. Blockages by FOG can cause sewage back-ups in homes and businesses. Sanitary sewer overflows in the streets of your neighborhood, caused by grease blockages, can present serious health concerns. Accumulations of FOG at sewer treatment facilities can drastically reduce the efficiency of sewage treatment processes, lowering the quality of reclaimed water being discharged into the environment. Increased maintenance expenditures and costly equipment failure can also be attributed to FOG accumulation in the sewage transport and treatment system. To make a long story short, what you do at home does have an effect on the outside world. Here are some helpful hints for reducing FOG in residential sewage discharges, keeping in mind that grease discharges are predominantly generated from dishwashing and kitchen clean up. Scrap excess food into garbage can instead of using a garbage disposal. Wipe out pans with a paper towel before washing them to remove all the grease you can. Never pour grease down sink drains, into toilets or down a garbage disposal. Collect cooking grease in a used glass jar and discard into the garbage. Do not pour cooking grease, bacon grease, butter, or any other melted grease down the sink drain, even if you use hot water. Do not use chemicals to remove grease clogs. Chemicals damage the piping system and move the problem. It does not go away. Healthy, FAT FREE sewers can do the job they are designed to do! Do your part to keep them clean. Wastewater is made up of about 95% water, the rest if solids such as organic and inorganic material that are carried in the system. Wastewater coming from your home or business into the treatment plant is called influent water, wastewater after it is treated and leaving the plant is called effluent water. What is effluent water and how is it processed? 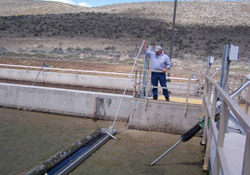 I explained above what effluent water is and there are many ways that it is processed. At IHGID we have a SBR or sequential batch reactor that uses extended aeration, with air that cycles on and off. That air provides a certain amount of dissolved oxygen to keep the microorganisms happy and busy cleaning up the waste. After a certain amount of time and treatment the water becomes clear and is then discharged to a primary pond. When this pond hits a certain level, a pump comes on and moves the water to holding ponds where we keep it stored until it can be used. Our effluent water is used by Sunridge Golf Course for irrigation, so when they need water we start sending it to them through gravity pipelines. On the way to the golf course it is routed through a chlorine system and sodium hypochlorite is added to kill bacteria to a level that is regulated by the Nevada Department of Environmental Protection, that level is 2 parts per million or less, so I do monitor that effluent water very closely. How many acres is the Wastewater plant and how many of them are developed? Our Wastewater plant is about 110 acres, not a lot is developed about 5 acres and that is where the plant and office are and about a half acre for the headworks. 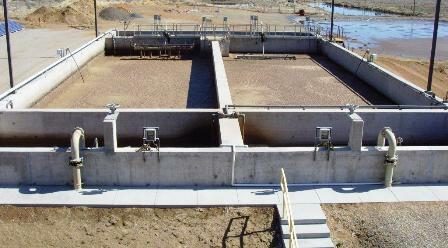 Hopefully soon we will have more developed with the addition of a sludge dewatering system. How many storage ponds are there and what are they used for? We have 6 storage ponds and 1 primary pond, combined these ponds hold roughly 34,000,000 gallons of water, and they are completely full after winter storage.